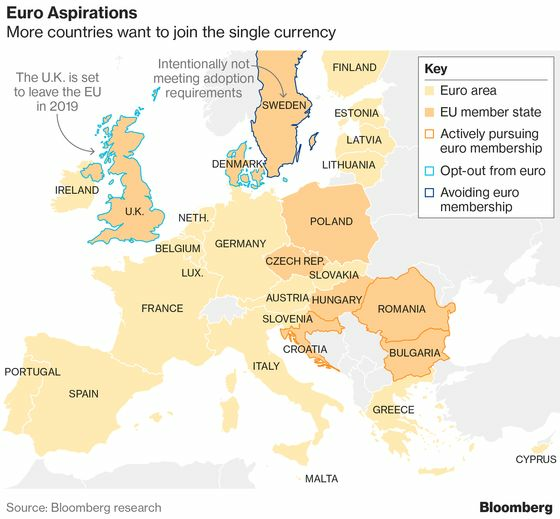 (Bloomberg) -- Whether it’s money-laundering scandals in the Baltic region or lingering memories of Greece’s debt crisis, bankers in Bulgaria worry that financial bother elsewhere will harm the country’s bid to adopt the euro. The Balkan nation has targeted membership of the European Union’s banking union and the ERM-2 waiting room for the single currency this year, before a planned switch to the euro in 2022. But advancing these goals could hinge on public opinion in the continent’s west. Europe has been roiled by financial scandals that began with revelations of money laundering at the Tallinn branch of Danske Bank A/S. It’s an inopportune juncture for Bulgaria, which wants to secure its place in the fast lane of EU integration as the U.K. quits. It’s next in line to become only the sixth of the bloc’s 11 ex-communist members to adopt the euro after Estonia, Latvia, Lithuania, Slovakia and Slovenia. Croatia is also keen. With stable public finances and its currency already pegged to the euro, Bulgaria fulfills the formal adoption requirements. But it’s been repeatedly criticized for failing to adequately fight corruption and money laundering, while the European Central Bank has concerns over long-term economic convergence and has sought additional guarantees over lenders’ health. Bulgaria’s endured its owns banking troubles. The country’s fourth-largest lender collapsed in 2014, triggering a government crisis and charges against two former deputy central bank governors. An asset review in 2016 showed two locally owned banks needed to raise capital. “We certainly encourage the government to make further progress,’’ said Benjamin Angel, director of the European Commission’s Economic and Financial Affairs Directorate-General. Speaking Thursday at a conference, he urged the country to address troubles in the insurance industry and lower the level of non-performing loans, which -- while falling -- remain “striking” at some banks.